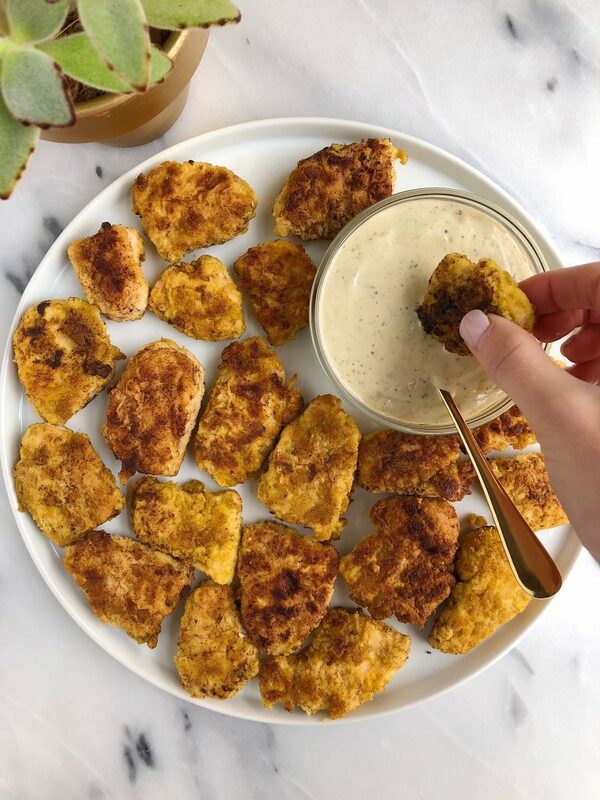 Paleo Crispy Chicken Nuggets made with a few simple ingredients for a delicious nut-free chicken recipe! Would you believe me if I told you I used to eat ALL kinds of chicken nuggets? Fast food chicken nuggets, chicken nuggets on a grilled cheese sandwich (called a chicken finger melt) and those dino nuggets and so on. The only way you could get me to touch chicken back in the day was heavily breaded, fried and likely didn’t even have real chicken inside. HA, how times have changed! Ever since I started introducing meat into my diet again last year (more on that here), I have been so addicted to drinking bone broth and cooking with it. I sip on broth every single day and use it in so many recipes when cooking. Sautéing veggies with it, using it in meatballs, meatloaf, you name it. It adds the best flavor and extra nutrients to any recipe. Or you can just open a package of Bonafide Provisions bone broth and sip it straight up. 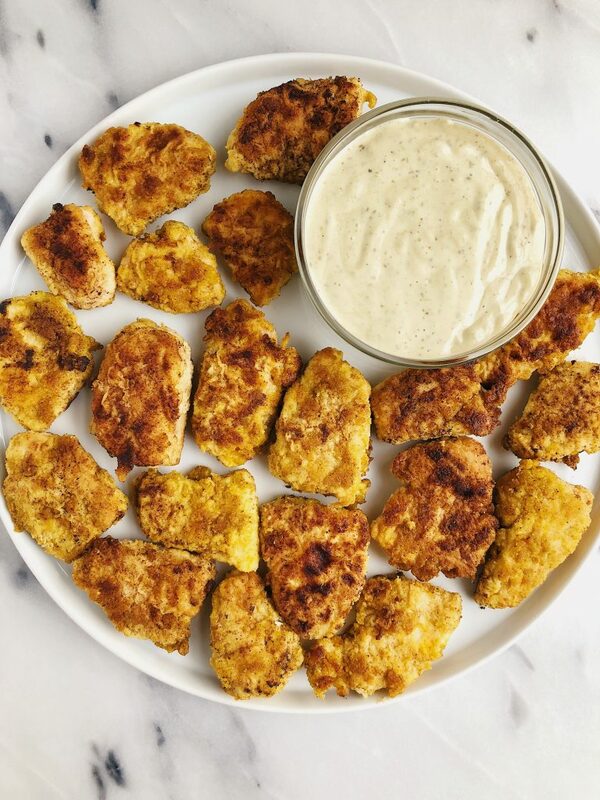 These paleo and nut-free chicken nuggets really take the cake though. They had me doing my happy dance around the kitchen and honestly I felt like I was 15 again eating chicken nuggets in Wendy’s. 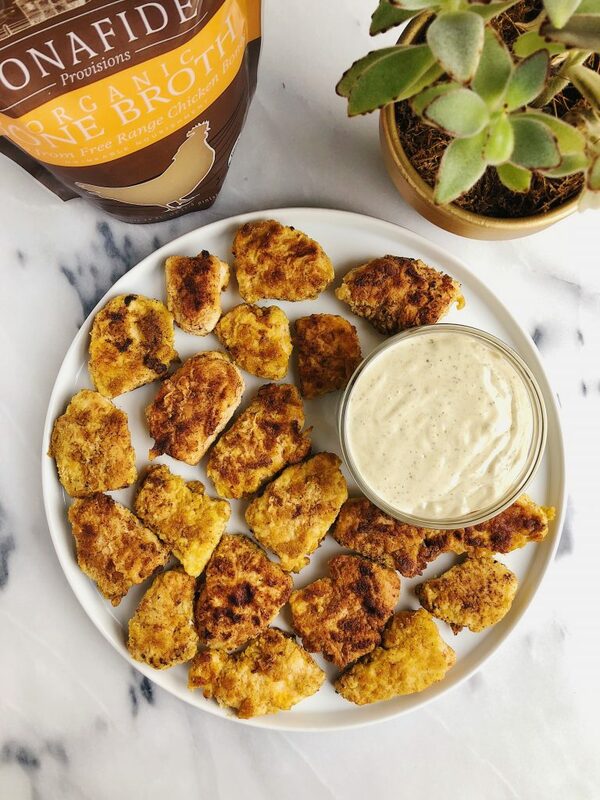 I have my paleo chicken tender recipe here on the blog but wanted to also create some nut-free ones for those with nut allergies. I realize how challenging it must be if someone is looking for a grain-free AND nut-free recipe. I hope ya’ll can eat coconut flour and tapioca because that is what we use for these. The tapioca really is needed and helps the flour really stick on the nuggets. I whisk the eggs together with Bonafide Provision’s bone broth and the flavor is unreal. If you have left over broth in the bag, simply add back to the fridge and cook again with it tomorrow or sip on it later. If you are wondering what the beep bone broth even is, head over to my Bone Broth 101 post! You will get the full low down on it and why I love Bonafide Provisions. Repeat for each piece of chicken and add more avocado oil occasionally to make sure the pan is always greased! Enjoy with your favorite dipping sauce, over a salad, in tacos, anything! Thank you Bonafide Provisions for sponsoring this post. It means so much to me to work with brands that I love and believe in here on the blog! Yum!! Could you also bake these?! I’d love to try a baked version. Is there a substitute you’d recommend for the tapioca flour? Thank you! Can’t wait to try these out! arrowroot flour or corn starch!